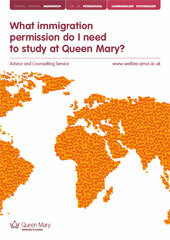 Welfare Advisers at Queen Mary are regulated under OISC guidelines to give immigration advice. The OISC (Office of the Immigration Services Commissioner) is an independent organisation that monitors immigration advice and services. Advisers have to attend regular training to be able to do this. If you are a national of a country in the European Economic Area or Switzerland, you can live, work and study in the UK with very few restrictions. For more information, see the UKCISA guidance for EEA and Swiss students. If you come from outside the European Economic Area and Switzerland to study at Queen Mary, you will be subject to some immigration control in the UK. Most students from outside the EEA will need to apply for Tier 4 (General) Student immigration permission. If you are not sure if you need to apply for immigration permission or what type of immigration permission, see our Student Advice Guide - What immigration permission do I need to study at Queen Mary?. 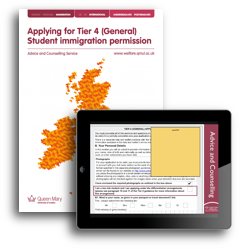 We have created written and video guidance to help you make a successful Tier 4 (General) Student immigration application. Follow this link to access our Tier 4 guidance. What immigration permission do I need to study at Queen Mary? If you will be coming to the UK to work for Queen Mary, for example as a postdoctoral researcher, you will need to contact the College's Human Resources department for information about applying for immigration permission, which would allow you to work in the UK. To find the appropriate person to contact, visit the Human Resources website.